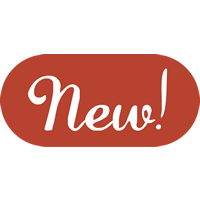 Top New Items for 18-19 | Walters Gardens, Inc.
(Yarrow) You'll love this new collection of Yarrow due to each member's taller, more substantial presence than other Achillea on the market. Although they have a taller height, all members have sturdy flower stems that will look great throughout the season of its bloom. With a range of beautiful colors, such as yellow, red, pink, and orange, you'll definitely find something that fits your needs. (Yarrow) One of the tallest varieties of the collection. Dark red flowers with a white eye are produced on top of an upright, round habit of silvery green leaves. (Yarrow) Bright yellow flowers contrast beautiful with intense silvery foliage; leaves are broader than typical. Compared to 'Sassy Sumer Lemon', this is more of a golden yellow flower and more silver leaves. (Yarrow) Large flower heads of dark orange blooms that mature to yellow. A taller variety matching 'Sassy Summer Sangria' in height. (Yarrow) Dark salmon pink flowers are produced on a dense, upright habit. As the flowers age, the color lightens to peachy pink. (Japanese Anemone) You'll love how this perennial will extend the seasonal interest of your garden. When other plants in your garden are fading, FALL IN LOVE™ 'Sweetly' is just getting started, producing rich, rose pink flowers in early fall. Semi-double flowers are produced above a large mound of dark green foliage. Spreads slowly through rhizomes. Plant with other fall bloomers, such as PRAIRIE WINDS® Ornamental Grasses and ROCK 'N GROW® Sedum. 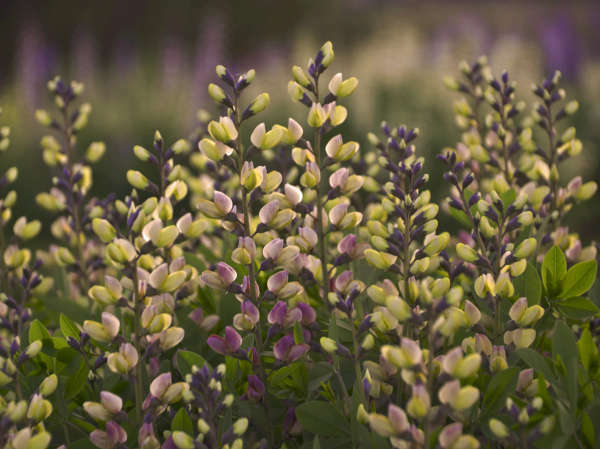 (False Indigo) Did you love the deep flowers of 'Dutch Chocolate'? Meet the new and improved version, 'Dark Chocolate'. This variety shares that same, nearly black, charcoal purple flowers, but has much longer flower spikes-up to 27 inches long. The flowers grow well out of the foliage, an improvement on its predecessor. Forms an incredibly full and bushy habit-a perfect substitution for shrubs if you're looking for structure in the garden. (Butterfly Bush) Think all Buddleia look the same? Think again! Unlike the typical Butterfly Bush, the panicles on this flowering shrub cascade downward, similar to the look of weeping willow or a bridalwreath spirea. Light lavender purple flower panicles are enormous at 12-14" long and 4" thick. They're nearly the size of your head! Compared to 'Lavender Cascade', this Buddleia is a slightly bigger in overall size, but it's the flower panicles that are significantly larger. (Threadleaf Coreopsis) Heat up your summer garden with SIZZLE & SPICE® Coreopsis, a new line of Threadleaf Coreopsis from Walters Gardens, Inc. hybridizing. Members of this collection have compact, rounded habits that are covered with flowers from early to late summer. With bright colors like red, orange, yellow and dark magenta, these varieties will capture your attention in the garden and on your retail shelves alike. The habit and performance of this red and white Tickseed are almost too hot to handle! 1-1½" wide, cream flowers have a dark red central eye and form a domed, rounded habit. As the flower ages, the eye gets bigger until it comprises most of the flower. The flowers will cover the gray-green, threadleaf foliage for a showy midsummer display. This brazen perennial demands attention during the summer with its cheery and bright yellow color. 1-1½" wide, lemon yellow flowers have deep maroon, nearly black centers. The flowers will cover the gray-green, threadleaf foliage for a showy midsummer display. This is a bright, sunny yellow versus the golden yellow color 'Curry Up'. (Pinks) We've been working hard on breeding Dianthus in the Walters Gardens, Inc. hybridizing department, and we now have a new collection of semi-double and double flowering cultivars as a result. Semi-double flowers with a mixture of flowers colors, from white to an intense pink blush. In a greenhouse, these flowers will be nearly white. Blue-green foliage. Semi-double, bright pink flowers have a deep red eye and serrated edges. Blue-green foliage. Small, semi-double watermelon pink flowers have a deep red eye. Distinctly silver blue foliage. (Coneflower) New from the Walters Gardens hybridizing program comes a collection that was a long time in the making and will certainly "catch your eye!" These single flowering varieties come in bold colors, better basal branching compared to older genetics, and are fairly compact. These pollinator friendly perennials are a must-have addition to your sun garden! Large, 4½", attractive, vibrant tangerine orange flowers with a dark cone. (Coneflower) Large, 5" golden yellow flowers with overlapping petals and golden yellow cones. Flowers mature to soft yellow. (Coneflower) Large, 5" vibrant coral pink flowers mature to lavender pink with wide petals. Dark, near black stems have a matching dark cone. The tallest of the collection. (Pineapple Lily) Want a tropical look that's hardy to zone 6? Look no further than 'African Night'. The name alludes to the rich, burgundy leaves that emerge in early summer. By the time the flowers spikes appear in late summer, the foliage will lighten in intensity. Rosy pink flowers are produced on dark burgundy stems with matching burgundy leaflets at the top of the flower spike. Like other late season bloomers such as Hibiscus or Perovskia, this will be one of the last to emerge in spring. This native of South Africa is called a Pineapple Lily for good reason-the inflorescence at the top of the flower scape looks like a tropical fruit. (Pineapple Lily) Get that tropical look right at home in your zone 6 garden! This takes you for an adventure all season long, beginning in early summer, when deep olive green, wide, strap-shaped leaves emerge. The foliage lightens in intensity when the flower scapes appear. In late summer, cream flowers age to deep rosy purple. Compared to 'African Night', 'Safari Adventure' has bicolor flowers (instead of solid rose) and lighter olive green leaves in early summer. (Lenten Rose) You've enjoyed the double-flowered Hellebores of the WEDDING PARTY™ series, try the equally lovely single-flowered selections of the HONEYMOON™ Series from Walters Gardens, Inc. hybridizer Hans Hansen. In his breeding work, he selects for plants with notable vigor, showy floral displays with large numbers of blossoms per plant, and rich flower colors. (Daylily) Another beautiful daylily from renowned daylily breeder Karol Emmerich! 6in triangular shaped flowers are peach with a wine purple eye. Like watercolor paint, the purple color blends to lavender purple toward the yellow throat for a stunning display. A thin, purple picotee edge frames the edge of the blooms. (Daylily) We've been eyeing this one-of-a-kind beauty for many years as we built up stock, and we're pleased to finally be able to offer it to you. 5½in, incredibly recurved lavender purple petals have a pronounced lavender blue eye. The two colors complement each other beautifully, and they practically glow in the sun. 2007 Stout Silver Medal Award Winner! (Coral Bells) It's always apple season with this Heuchera! Watch with delight as this unique plant changes throughout the seasons. Newly emerging leaves have red veining that lightens with age. Chartreuse yellow leaves have wavy, rippled edges that will mature to apple green leaves later in the season. You'll appreciate its dense, full habit and good vigor. (Coral Bells) For those that loved the bold texture of CINNAMON CURLS™ comes an improvement that keeps the popular shape and color, but adds increased vigor and size. New leaves are bright red, heavily ruffled, and form a low, mounding habit. In summer, the bright color persists, maturing to a rich mahogany red. Dark burgundy stems hold light pink flowers and dark rose calyxes from early to midsummer. A wonderful color for all seasons. (Coral Bells) Have you struggled with chartreuse-leaf Heuchera burning in the past? If so, you'll love this new yellow Heuchera. Its best color is in part or filtered shade, where we've been pleased to observe almost no burning, a problem that plagues other varieties. Slightly ruffled, chartreuse leaves are produced on an especially vigorous habit, thanks to its Heuchera villosa heritage. The color will be more lime green in deeper shade. Over time, 'Lemon Love' will gradually spread to about 3 feet wide if given the space. Cream flowers with hints of blush in the calyxes are produced above the foliage in early summer. A great color for brightening up your shade! (Coral Bells) The name says it all! Massive glossy, mahogany red leaves form a substantial clump of foliage. Slightly ruffled leaves can grow up to 6 inches wide. The flower stems are proportionate to the size of the clump: very thick, burgundy stems holds masses of light pink buds with cream flowers. Although the color is consistent throughout the season, older leaves become more coppery with age. (Coral Bells) Looking for an orange foliage plant for your shade garden? You found it! Large 4½-5", apricot orange leaves have a silver overlay. Its beautifully pronounced ruffling reveals bright pink undersides of the leaves. The bright orange color is most pronounced in the spring with newly emerging foliage, over the warmer months the color mellows. Burgundy stems hold airy, cream flowers. PRIMO® Heuchera differ from the DOLCE® Series with larger, faster growing habits and a more sunbstanial landscape presence. (Coral Bells) Just like the popular 'Silver Gumdrop', this new Heuchera boasts both beautiful foliage and excellent flower performance. Silvery green leaves have dark green veins. Compared to 'Appletini', this is a rich, deep shade of green rather than chartreuse yellow. Although the foliage is attractive by itself, what really makes this plant stand out is the fabulous long season of bloom. The flowers are bicolor, with dark pink petal tips and light pink bases are produced early to midsummer. Stunning! (Coral Bells) Do you love 'Berry Timeless' but hoped for that flowering performance in different foliage colors? Your wish is granted! New for 18-19, the Timeless Collection now boasts different colors such as purple, yellow, black, and silver. Each has a reblooming flower performance like their predecessor with similar sizes for ease in combination. 'Timeless Treasure' has small, pewter leaves have dark veins. The habit is totally covered with large rosy pink flowers on proportionate mahogany stems. Repeatedly sends up new flushes of flowers and blooms prolifically. (Coral Bells) The intense purple color of these leaves are second to none! Compared to 'Blackberry Ice', the foliage is larger, a richer hue, and holds onto its purple color for much of the season. Large, scalloped, incredibly glossy leaves are a bold shade of purple. Charcoal veins accent the leaf color that make the leaves really pop. Dark stems hold rosy pink calyxes and white flowers. A must have! (Rose Mallow) We called this hardy hibiscus "the holy grail" from its inception because we knew we had something special. There's a whole lot to love about this plant, beginning with its incredible dark, near-black foliage of beautiful, oval shaped leaves. Rich, deep red flowers are enormous at 8-9 inches across. The red and black colors perfectly complement each other. As an added bonus, once the flowers are finished, bright green calyxes starkly contrast the dark foliage. Use in an area with consistent moisture as a focal point to build your garden around. (Red Hot Poker) A brand new genus for Proven Winners® Perennials! Members of the PYROMANIA™ Collection are a rainbow of hot colors including red, orange, and yellow. The spiky flowers and upright habit gives a very unique drama to your landscape, with rebloom extending the color late into the season. Grass-like foliage provides textural contrast to bold-leaved perennials, like Hibiscus. These tropical looking plants are hardy to either zone 5b or 6, if you provide protection. A must have! (Red Hot Poker) The sky's the limit on this new tropical looking plant! Coral orange flowers open creamy white on perfectly formed spikes. The beautiful bicolor flowers are produced above a large clump of foliage and blooms for many weeks beginning in early to midsummer. This plant may look exotic, but it's hardy to our Michigan zone 6, heavy snowfall winters, possibly hardier with winter mulch and protection. (Red Hot Poker) Having this plant in your garden will definitely feel like winning the jackpot: useful garden height, vigor in the landscape, and a rich flower color. Bright reddish orange flowers open yellow for a bicolor effect atop a large mound of grass-like, green foliage. After the first flush of flowers, this Kniphofia will continue to rebloom with new flower spikes, staying in bloom for most of the summer. 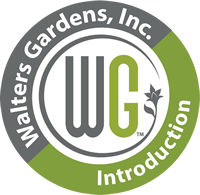 Tested for hardiness in our Michigan zone 6, heavy snowfall winters, and could be hardier with winter mulch and protection. 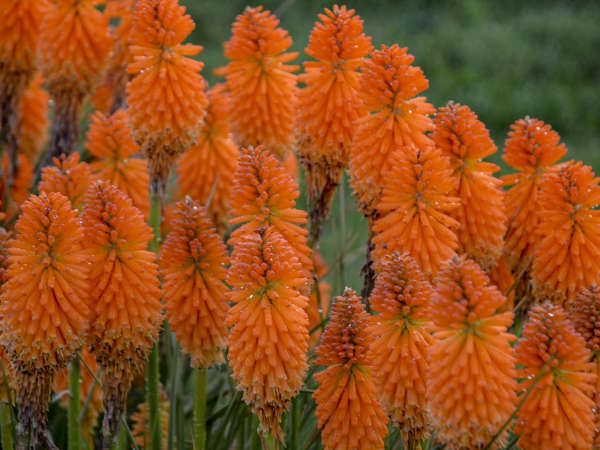 (Red Hot Poker) Unlike a poker player, this plant is more than happy to show you all of its fantastic cards: useful garden height, vigor in the landscape, and a rich flower color. Red-orange flower spikes appear above a substantial clump of grass-like foliage. After the first flush of flowers, this Kniphofia will continue to rebloom with new flower spikes, staying in bloom for most of the summer. Tested for hardiness in our Michigan zone 6, heavy snowfall winters, and could be hardier with winter mulch and protection. (Bee Balm) It's electric! That's what you might think when you look at the fabulous color of this new interspecific hybrid of Bee Balm. Intense, dark neon pink flowers are produced above an upright mound of glossy, dark green foliage. The large, 3" flowers practically glow, lightening slightly for a two tone effect. Look for more bright and intense colors in the future! Monarda is native to eastern North America, so it is easy to grow and it multiplies quickly. The flowers' sweet nectar attracts scores of hummingbirds, butterflies, and bees to the garden. The aromatic foliage smells like mint when crushed and is often used to flavor teas. (Catmint) A purr-fect Catmint for fans of 'Cat's Meow' who love the look but want a smaller scale version. In addition to being a little over half the height, 'Cats Pajamas' also blooms about 2-3 weeks earlier than 'Cat's Meow'. The ball-shaped habit carries long, dark flower stems that hold indigo blue flowers. Unlike older varieties that only produce flowers at the top of the stems, this improved Catmint has blooms from the soil to the tips of the stems. Even when the flowers are past peak, the color of the rosy purple calyxes give your garden an additional splash of color. As an added bonus, the small, aromatic leaves keep deer and rabbits away. (Fountain Grass, Ornamental Grass) This seedling of 'Ginger Love' has the same intermediate height as its parent, but with noticeably darker seed heads. Its graceful, arching habit has medium to dark green foliage with burgundy accents. The darker red inflorescences begin to show color in late summer and continues until frost. Since this is not a sterile variety, make sure to deadhead seed heads so they don't seed around. (Hybrid Spring Phlox) It's easy to see how this series got its name when they explode into bloom come mid spring. Like a party for your garden, the Bedazzled series members produced star-shaped, notched flowers that cover a rounded, spreading habit. These bloom a few days or a week before Phlox subulata, depending on the weather. These will soon become some of your spring favorites for your garden. These will be moderate growers year one in the garden, but will become a groundcover with age. (Hybrid Spring Phlox) Lavender pink flowers with a subtle purple eye. (Hybrid Spring Phlox) Bright, medium pink flowers with a small, dark purple star-shaped eye. (Lungwort, Bethlehem Sage) Lungwort are one of the classic shade perennials, and what better way to celebrate spring than with an explosion of pink flowers? Large, bright rose pink flowers stay consistently pink and are produced in large flower clusters over a low and wide habit. Dark green leaves are lightly to moderately speckled with silver, so you can enjoy the interesting foliage after it has finished blooming. This plant will thrive in part shade to full shade as long as you provide moisture. (Black-Eyed Susan) Finally, a Black Eyed Susan that's resistant to the Septoria leaf spot! Thanks to the thinner and hairier leaves, this hybrid Rudbeckia shows no signs of the fungus even in wet, humid conditions. A dome-like habit of golden yellow flowers with black centers are produced heavily from July to September here in Michigan, with some color until frost. Destined to be the new staple for landscapes! From Brent Horvath of Intrinsic Perennial Gardens. (Perennial Salvia) The flagship variety for this new Perennial Salvia series is in a class of its own! This Salvia nemorosa hybrid reblooms multiple times throughout the summer if the spent flower stems are cut back-one of the very best for consistent rebloom. Soft icy blue flowers cover the perfectly rounded plant. The sheer density of flower stems will certainly catch your eye as you walk past! Compared to 'Crystal Blue', this has thinner flowers and a rounder habit. An easy to grow perennial that's mostly unbothered by deer and rabbits. This is the perfect flower to kick off your summer garden! (Perennial Salvia) This Salvia nemorosa hybrid will impress you with the number of times it reblooms! Sheer back the spent flowers and enjoy again throughout the summer. Dark pink flowers are produced on darker pink calyxes on a perfectly rounded, dense and beautiful habit. This shorter stature Salvia will tuck in nicely to all sorts of places in your perennial garden, planted en mass makes a perfect edger. An easy to grow perennial that's mostly unbothered by deer and rabbits. (Perennial Salvia) This Salvia nemorosa hybrid will impress you with the number of times it reblooms! Sheer back the spent flowers and enjoy again throughout the summer. Violet blue flowers are held on rosy purple calyxes on a perfectly rounded, dense and beautiful habit. This shorter stature Salvia will tuck in nicely to all sorts of places in your perennial garden, planted en mass makes a perfect edger. An easy to grow perennial that's mostly unbothered by deer and rabbits. (Stonecrop) This is no ordinary Sedum! You can't help but stop and stare at this beautifully variegated groundcover stonecrop from Hortech, Inc. Small, serrated leaves are dark green with very wide creamy yellow margins. From a distance, the margins are what catch your eye. You may notice that the creamy margins become tinged with pink blush tones with cold temperatures late in fall. A great choice for tucking into rock gardens or dry landscapes, or in combination container with succulents! (Stonecrop) Sedum is a genus that tends to be overlooked throughout the summer, but comes into laser sharp focus in late summer to early fall. 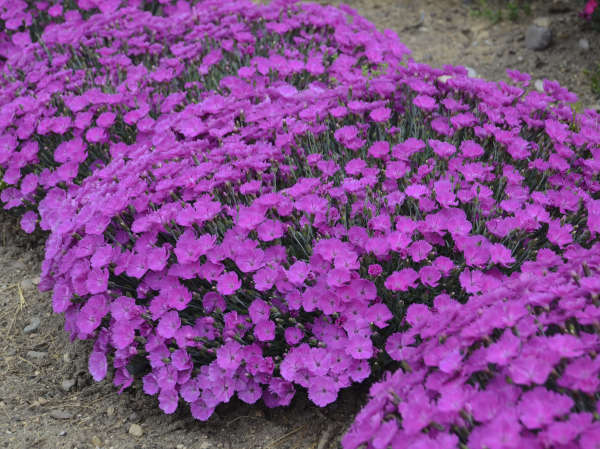 'Steel the Show' is the perfect groundcover to add to any sunny garden. In our trials, this stood out as one of the most silvery leafed with its bright, blue green foliage. The tiny leaves give an airy look to the plant, and will combine well with broad textured plants. It's one of the latest to bloom among Sedum, so you can extend the appeal of your garden with its rich, rosy pink flowers. (Spike Speedwell) 'Lavender Lightsaber' joins popular companion 'Blue Skywalker' except with soft lavender flowers covering the top half of a columnar, upright habit. Bucking the trend of smaller and more compact plants, 'Lavender Lightsaber' fills a need of adding height to the middle of the border. Try this perennial in narrow spaces needing height, such as small city gardens or narrow borders. (Spike Speedwell) Joining the popular MAGIC SHOW® Collection, this plant brings the "oohs" and "ahhs" with its early blooming performance, outstanding flower color, and impeccable habit. One of the earliest Veronica to bloom, this plant produces thick spikes of violet blue flowers that cover the top half of a low, wide habit. 'Wizard of Ahhs' requires vernalization to bloom. This is an improvement over 'Hocus Pocus' in the Proven Winners® perennial lineup.